Liberty Square, a reproduction of a colonial era town is one of the smallest lands in the Magic Kingdom but they definitely pack in the theming. It feels a bit more low key than the rest of the park but I loved it. The buildings are gorgeous and it has a really patriotic feeling. There are only three rides but we spent ages looking around and found plenty to see. Loads of weather vanes and clapboard buildings make it a super pretty area. We headed first for the Liberty Bell. Apparently for the 200th birthday of the USA they cast and moulded 50 replicas of the Liberty Bell. Each state was to get one, Pennsylvania already had the original in Philadelphia so gave their replica to Disney World. 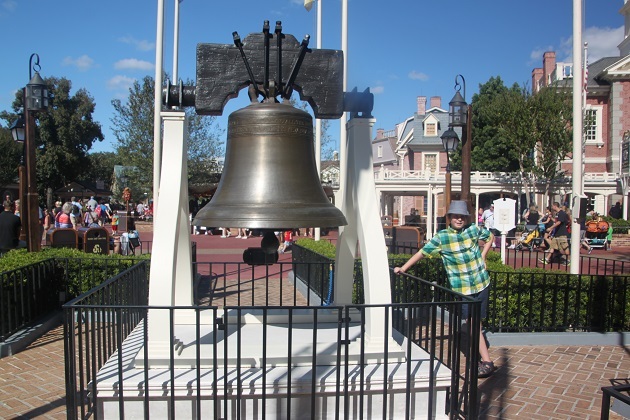 It was placed in Liberty Square and to this day Florida is the only state with 2 of the 50 replica bells. 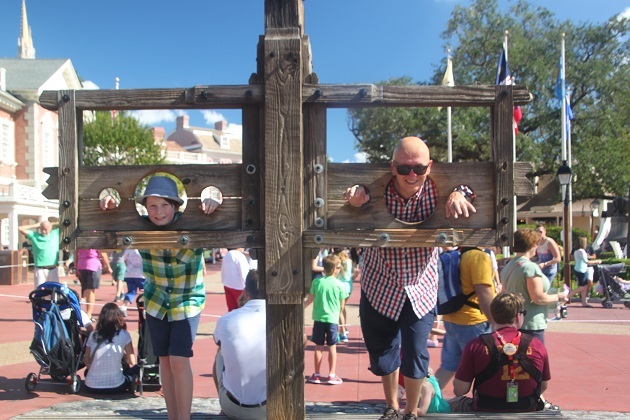 Husband and Son did of course have to climb into the stocks for the requisite pictures before we had a closer look at the buildings. Look carefully and you can see the shutters are all a little bit wonky. Apparently during the revolutionary war they took the metal hinges off the shutters and melted them down to use as bullets. They rehung the shutters with leather straps, the leather stretched over time and the shutters hung at a wonky angle. Plenty of attention to detail in the Magic Kingdom, they hang at a tilt here too. We found another detail from those days – the path way has a different coloured area in the middle. This symbolises the sewage that would have flowed down the streets in the 1700’s. Thankfully this is only a visual effect. Son was keen to get going with a ride so we headed first to the Haunted Mansion. We are wimps and not keen on ghosty or creepy stuff but loved this place. It sits up on a hill and right from the moment you enter the gates the theming is superb. We walked through a graveyard full of funny tombstones and were approached at the door by a creepy butler who took us to the “stretching room.” Some great special effects then we boarded our Doom Buggy to ride through the mansion and its rooms. All full of friendly and cute ghosts, we saw a ballroom, a graveyard and plenty of mild and non scarey special effects. The hitch-hiking ghosts at the end did not disappoint. We all gave this place a big thumbs up – full of atmosphere, charm and just classic Disney. One last thing we did before leaving was to check out the ghost hearse at the back. Next up was the Hall of Presidents – about a half hour show in a really impressive theatre modelled on Philadelphia’s Independence Hall. They have every US president represented on stage during the show but apparently they focus on those who guided America through its most trying times. Such a patriotic show and they bring waxworks to the very next level here. I loved the glimpse into history and was blown away by how lifelike and realistic those presidents looked. 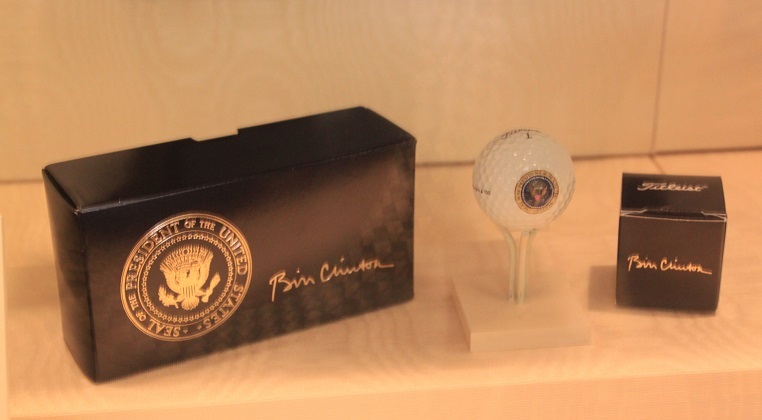 Outside in the lobby area – most people just left straightaway – we lingered a while as they have the most fascinating collection of presidential memorabilia in glass cases. 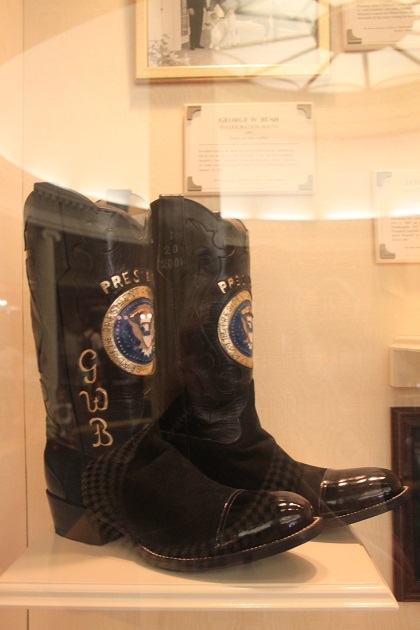 As well as some First Lady dresses there were the cowboy boots George W Bush wore at his inauguration, Bill Clinton’s golf balls and so much more. 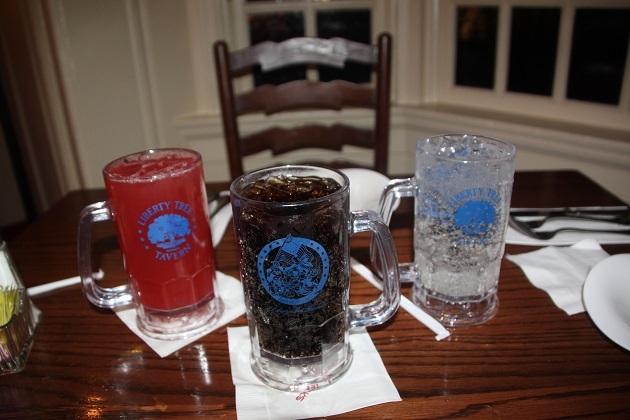 After all of that it was time for something relaxing – a trip on the Liberty Belle Riverboat. This was a nice, gentle 15 minute ride on a 3 storey paddle steamer replica all around Frontierland and Tom Sawyer Island. Very relaxing, great views and a nice break from all the running around and heat. Before our dinner at the Liberty Tree Tavern we had a quick look at the Liberty Tree. Apparently in colonial America it was traditional for each town to have its own liberty tree, symbolising the fight for independence. It is no different here. Thankful we had booked dinner well in advance at this restaurant – it was seriously busy and we still had to wait 20 minutes for a table. Our server announced our arrival in the restaurant with a proclamation of “Hear Ye, Hear Ye” and our name. Son loved that. Inside we found some nice Colonial style decor but I did think it was a little lacking in atmosphere. Food was certainly plentiful – served on vast platters in the middle of the table. No choice, it was a set menu but we watched agog as massive plates of turkey, mashed potatoes, gravy, stuffing and sweet potatoes arrived. All very nice but the three of us barely made inroads into it. A giant’s portion of apple cake and ice-cream followed and nearly finished us off. Home after all that to sleep off the food overload. Sounds like a very interesting and fun day! It was – looking back now at those blue skies and yearning for them!!! Hahaha! 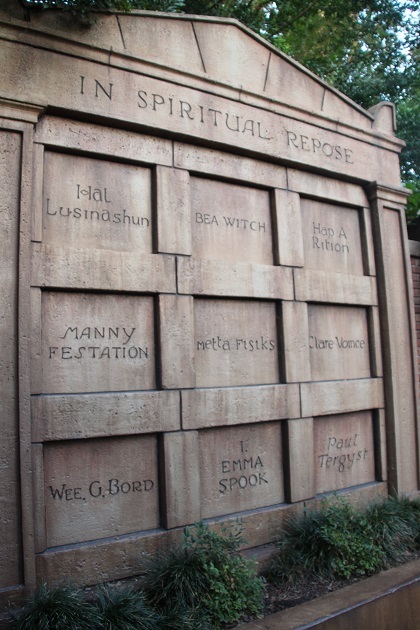 I love the pun names on the tombstone at the Haunted Mansion! We had a chuckle at those too!! It seems that booking in restaurant is really necessary ! Looks like a fun day ! That restaurant was so busy, we couldn’t believe it (not that great either!!). We loved that day though, like you say loads of fun. I hope no-one threw rotten fruit at those prisoners in the stocks! As for GWB’s boots – words fail me. That was the great thing about this trip – we really took our time and didn’t try and cram in all the parks. We got to find so many things and intriguing places we’d obviously skipped before! It is – super pretty! So where is this? The US somewhere? Your son must be doing well with his history and geography as much as you take him around and visit places with history! This is Disney World in Florida – not too much history and geography but loads of fun!! Oh, I missed the crucial word “reproduction” at the beginning… 😀 And why you mention the rides makes more sense as well when I understand it is IN Disney World!!! Oh my, time for bed. Clearly. He he – I know that feeling, long days with kids can have that effect!! Plus you just got back from the other side of the world!! The Haunted Mansion was one of my highlights. I thought the special effects were really well done and the whole ride really well choreographed. It also had the most interesting queue with lots to look at with each turn. We also really enjoyed the Hall of Presidents and the display cases outside. I also enjoyed the fact it was less flashy and razzmatazz and a whole lot quieter than most of Disney, a little refuge of calm. We didn’t go on the riverboat trip. I wish we had done. That’s exactly what it was – a refuge of calm. I loved it all too. We’d been here a few times before but never to the Haunted Mansion, I have no idea why as we all loved it, classic Disney. I couldn’t believe most people just dashed out after the Hall of Presidents show and missed those display cases, again another highlight for me!! When we did the Hall of Presidents, there were probably only two dozen people in the auditorium – and we were eight of them. It’s a shame more people don’t stop in. However, I guess we had the time because we don’t do any of the massive roller coasters. Same for us – well not my husband but my son and me – rollercoaster wimps!! The extra details really make this post special; liberty bell, shutters, sidewalk. Haunted mansion is one of my favorite rides and it is because of the welcome by the butler. That butler is amazing – he really set the scene for us!! The haunted house was a real favourite with my children and I liked the Hall of Presidents! We’d never been inside the Haunted Mansion before, it was a great surprise. I’d seen the presidents show but still enjoyed it. The story of the shutters is fascinating. How great they replicated it. Dinner sounds immense! I can just imagine how big the portions were! Oh those portions – so huge it looked like we hadn’t even touched the food…. and we were still so full up!! So strange – I don’t think I’ve been to this part of Disney..taking note! Don’t miss it when you go back to the Magic Kingdom – it’s really special. Looks a very pretty reproduction of colonial America Joy and with a lot of attention to detail! 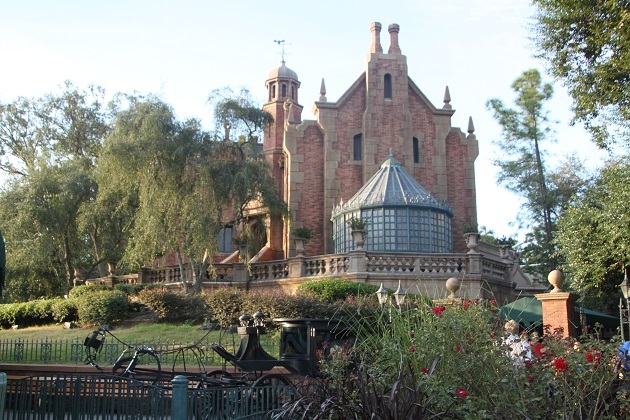 The Haunted Mansion sounds great fun and the Riverboat cruise on the paddle steamer sounds very pleasant and a good chance to out your feet up a bit (walking round those places can really be tough on the feet!). I would have managed a very small portion of the food too but it would have been a fun experience to eat there! The portion sizes were so enormous Rosemary, it puts us off a lot when food comes heaped up like that. It looked as if we had not had any of it, even though we were all full to bursting at the end!! This is a really pleasant area though, pretty and relaxing – it gets my thumbs up!! great day! Place with “ghosts” is soooo cool! It was one of our favourites in the whole park – so much fun!! I can’t believe we’d never been on this ride before George, I think we’d been to the Magic Kingdom at least 4 times, what was wrong with us and how did we miss it!! Such a lot of fun, it is one of my favourites now too!! It’s a gorgeous little area! We’ve been in transit in Philadelphia but that’s it!! I would love to visit though and explore sometime. Thank you – hope to take you up on that some day! !